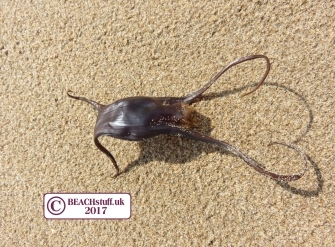 When a creature has emerged from its egg, the remains of the egg case often gets washed up onto our beaches. 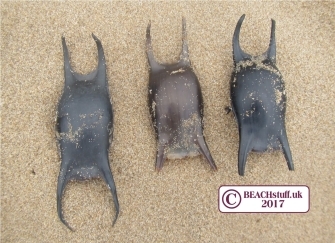 I assume that mermaids are now swiping their debit cards like the rest of us instead of carrying around bulky purses but, back in the day, it was thought they would use the egg cases of rays/skates for their coins. 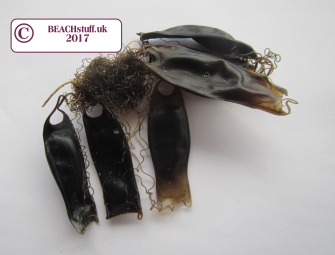 And presumably, after they'd spent up, they would simply throw their purses away which is why we find so many of them on our strandlines. This is the smallest of the ray egg cases shown here. 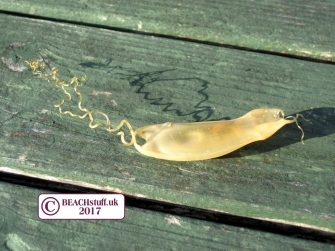 A relatively 'stocky' egg case with short tendrils. 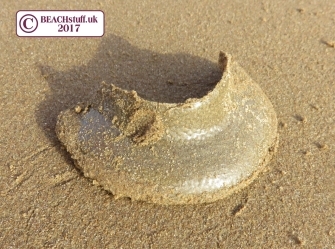 This egg cases has distinctive 'frilled' sides. 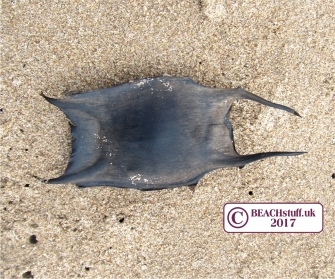 The cuckoo ray is a deeper water species and so its egg cases wash up relatively rarely. It has long, slightly curled tendrils. Confusingly, this shark is also known as a lesser-spotted dogfish. And, when it is served up in a restaurant, it is called a rock salmon, although it is certainly not a salmon. It is the smallest of all the egg cases we tend to find. A dogfish can be seen here. 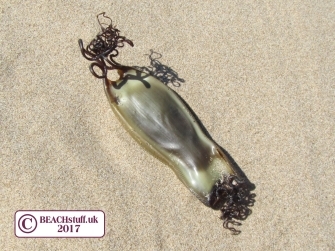 Sometimes, a bunch of cat shark egg cases will be washed up with their curly tendrils all tangled up together. 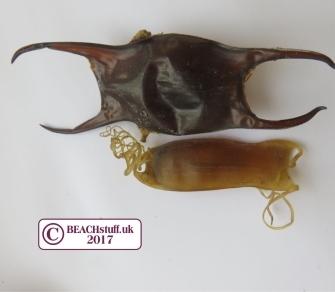 This is generally a larger egg case - it still belongs to a type of shark but is three times the size of the small spotted catshark case (above), for example. It is often around 10-15 centimetres long. 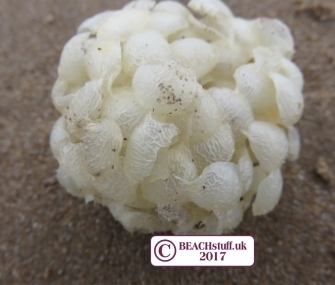 These balls of papery, veined, little eggs are whelk eggs, large, slow-moving sea snails that live in our waters. They have sometimes more orangey or beige than white depending on how old they are. 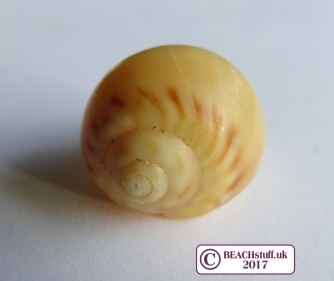 By the time we see them on the strandline, the tiny snails have usually long-sinced hatched. 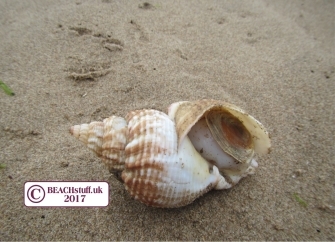 The whelk shell below was approximately 10 long. These are small, flat papery upside-down heart-shaped eggs which, in number, look a bit like an eaten corn on the cob. On the left, they are stuck fast to razor clam shells although they have long since hatched. The sting winkle can be seen here. 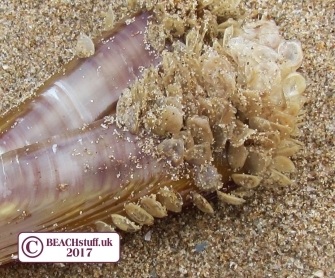 The necklace shell (also known as a moon snail) (pictured below), carries its eggs on a 'skirt' which is stuck all around the outside of the shell. 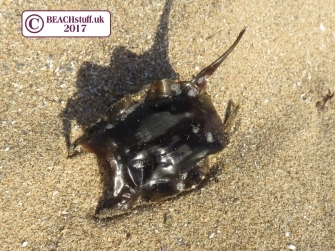 The skirt itself, once it is picked up on the strandline, is like a thin dried leather material, generally still holding the shape it would have had when it encircled the parent's shell. The photo on the right shows how the snail makes itself a skirt which is wrapped around the outside of the shell. The eggs are protected underneath it. Source:Jarek Tuszyński,Wikimedia Commons. The licence. 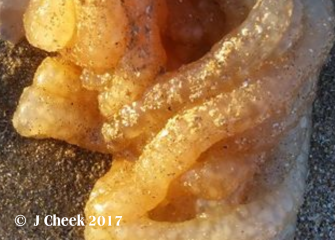 This lump of tiny fish eggs (known as roe) is from a lumpfish. It looks just like a clump of old, dried up tapioca pudding. That reminds me - what's for tea? 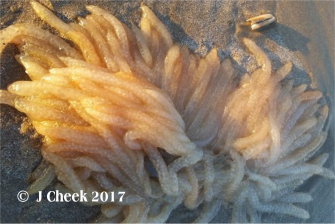 Squid eggs can be washed up in masses looking a bit like a mop of soft stringy straws. 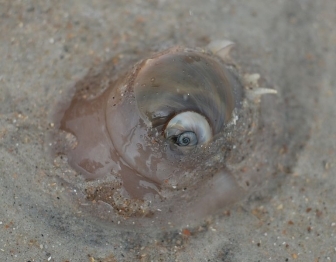 The female does her best to lay her eggs (which she does thousands at a time) in safe places but she doesn't stay with them and as they can take two months to hatch, they can be washed away like this. For more on squids, have a look at our page on cephalopods. 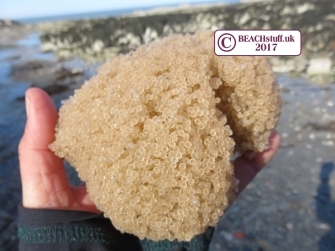 Joanne found these (and many more) on Camber Sands.